This Chevrolet Silverado 1500 boasts a Gas/Ethanol V6 4.3L/262 engine powering this Automatic transmission. ENGINE, 4.3L ECOTEC3 V6 WITH ACTIVE FUEL MANAGEMENT, DIRECT INJECTION AND VARIABLE VALVE TIMING includes aluminum block construction with (FHS) E85 FlexFuel capability, capable of running on unleaded or up to 85% ethanol (285 hp [212 kW] @ 5300 rpm, 305 lb-ft of torque [413 Nm] @ 3900 rpm) (STD) (Includes (FHS) E85 FlexFuel capability., Windows, power front and rear with driver express up and down and express down on all other windows, Wheels, 17" x 8" (43.2 cm x 20.3 cm) stainless steel clad. Wheel, full-size spare, 17" (43.2 cm) steel, Transmission, 6-speed automatic, electronically controlled with overdrive and tow/haul mode. Includes Cruise Grade Braking and Powertrain Grade Braking, Transfer case, with floor-mounted shifter (Included with 4WD models only. ), Tires, P255/70R17 all-season, blackwall, Tire, spare P255/70R17 all-season, blackwall (Included and only available with (RBZ) P255/70R17 all-season, blackwall tires. ), Tire Pressure Monitoring System (does not apply to spare tire), Tire carrier lock, keyed cylinder lock that utilizes same key as ignition and door, Tailgate and bed rail protection cap, top, Steering, Electric Power Steering (EPS) assist, rack-and-pinion, Steering column, Tilt-Wheel, manual with theft-deterrent locking feature. 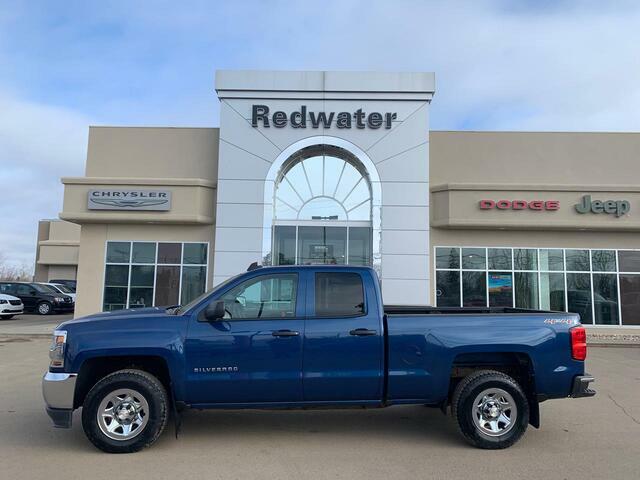 Live a little- stop by Redwater Dodge located at 4716 48th Ave PO Box 407, Redwater, AB T0A 2W0 to make this car yours today! ENGINE, 4.3L ECOTEC3 V6 WITH ACTIVE FUEL MANAGEMENT, DIRECT INJECTION AND VARIABLE VALVE TIMING includes aluminum block construction with (FHS) E85 FlexFuel capability, capable of running on unleaded or up to 85% ethanol (285 hp [212 kW] @ 5300 rpm, 305 lb-ft of torque [413 Nm] @ 3900 rpm) (STD) (Includes (FHS) E85 FlexFuel capability. Seats, front 40/20/40 split-bench, 3-passenger, driver and front passenger manual recline with outboard head restraints and centre fold-down armrest with storage. Vinyl has fixed lumbar and cloth has manual adjustable driver lumbar.